We smile when there is something good going on. We smile because we feel happy, we feel joy, or simply because we have to act polite when meeting other people. Smiling can change your mood, because human emotion is highly malleable. Pretend that you are happy, and you will feel happy, pretend that you are angry, and you will feel angry—this is an effect well known to actors, and has been extensively studied by psychologists following the tradition of William James and self- perception theory. However, there's much more to smiling. There's evidence that people found cartoons funnier when they bit a pen in a way that triggers their "smiling" muscles, and less funny when they pouted. Recently, scientists from the University of Sussex reported that when we smile, we perceive other people's frowns as less severe, and when we frown we see other people's smile as less joyful. But smile, it seems, can even change the way we see neutral expressions. 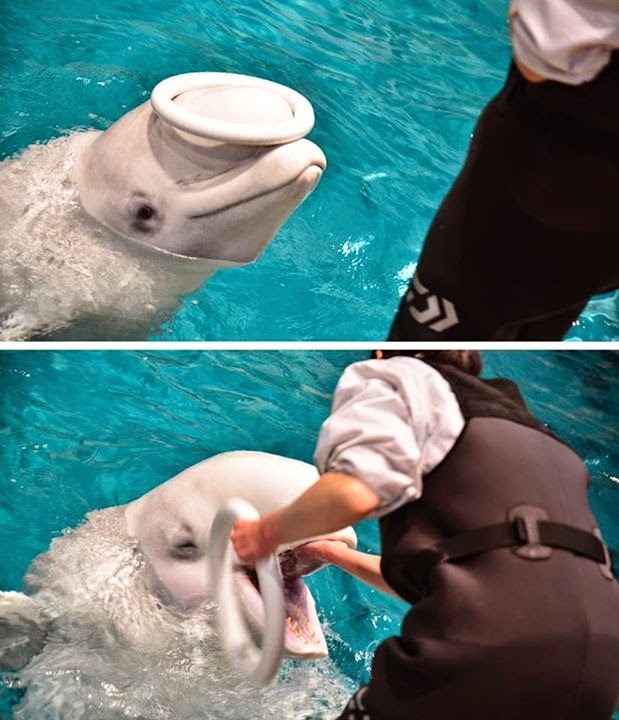 Captured this when I visited the Nagoya Port Aquarium in Japan, obviously the happiest beluga in the world. In a new study, Dr Tina Forster from the Cognitive Neuroscience Research Unit at City University London tested and measured brainwaves of 25 volunteers as they observed pictures of faces that were smiling or showing neutral expression. In the study, the researchers observed two spikes of electrical activity in the brain that are responsible for the processing of faces, and the spikes will be more pronounced when the faces show emotional expressions. Their results how that when the participants saw the happy faces, their faces changed from neutral to happy, as just we'd expect. However, the interesting thing about the results is that when the participants adopted a smiling face, they saw—or their brain perceived—a neutral face as if it were smiling. Captured these heart-warming images outside the Nagoya Port Aquarium in Japan. This has a profound effect on human psychology, because if you were to enter a room full of strangers with a smiling face, you will most likely see those faces smiling back at you, even when they were just looking blankly at you. And that's something really worth feeling happy for.